Remote control tractors can be a lot of fun for both boys and girls of all ages. Some toy tractors are more suitable for younger children while some are designed to accommodate children of every age. Remote control toys are a great way for children to develop hand-eye coordination as well as learning about some aspects of farming and construction. There are many things to consider when choosing a toy tractor. With so many available to buy it can easily be confusing to a parent. This guide will help you choose the best construction toy tractor for your child. So read on and discover the tips to consider and the products reviewed. Durability. You want to make sure that your toy tractor is durable and sturdy enough to drive overall forms of terrain. Tractors that can’t cover all types of driveway, grass, and ground will be a disappointment to children everywhere. Range. You’ll want to know what the range is for your toy. How close does the controller have to be to the tractor in order for it to work? A more powerful device will allow your child to drive their construction toy further away. A less powerful device will require that the tractor stays closer to the controller which may be better for younger children that need to be supervised. Battery life. All children want to play with their toys for as long as possible, so it’s important to know how long your battery is going to last. It’s also good to know if it’s rechargeable and how long it’ll take to recharge. Constructed of highly durable alloy this shovel loading tractor features 2.4 G radio control, for large well-treaded tires and a four-wheel drivetrain. 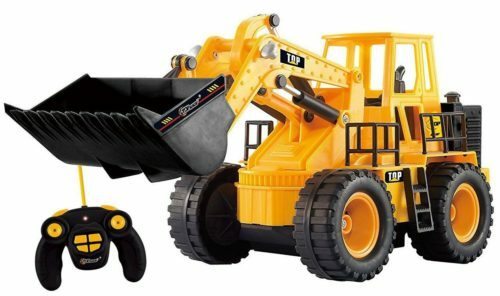 This solid powerful toy will scoop up gravel and dump it. Featuring four-wheel drive, you can rest assured that this tractor will travel over any terrain your child wants to play with it on. The large size of the wheels allows the tractor to grip in any terrain. 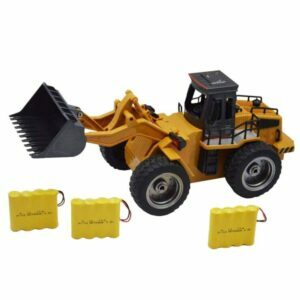 Boasting a radio control range of up to 300 feet, this toy construction tractor can also operate other pieces of your construction set as well as cars at the same time. This tractor also features fully functional lights and sounds for a truly entertaining play session. The Top Race tractor is a 5-channel fully functional front loader construction tractor. It boasts working lights and sounds and it drives forward, backward, left, right, and it also has use of the front end loader which will move up and down. This construction tractor resembles a smaller version of a real-life tractor and is at a lifelike scale. It’s ready to run the transmitter uses three double AA batteries and it’s designed for children ages 3 and up. Designed to be used both indoors and outside this rugged tractor will crawl over any terrain your child is playing on. True life this toy construction tractor will let you use the front end loader to shovel mud or even small pebbles. The Cross-Race model features six channels of a fully functioning control unit. This tractor is also a crawler and an excavator. It can also function as a bulldozer. Instead of wheels, this construction toy tractor features high-quality treads on its Caterpillar Track which helps propel it through dirt, rocks, and sand. 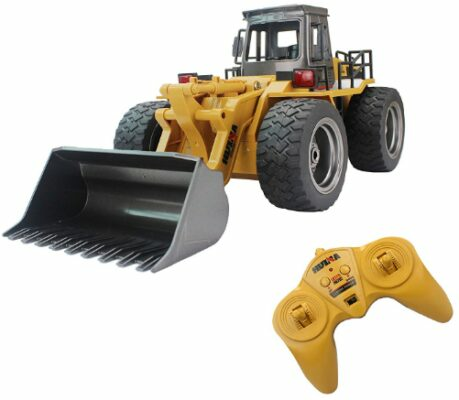 This Remote Control Construction Bulldozer has CR 6 Channel Full Function with a Front Loader Dump Truck, which is great for kids who like to play in the garden or sandbox. 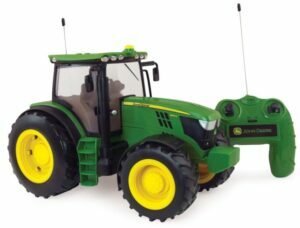 This tractor works in all directions and features fully functional lights and sounds. The high-quality alloy and plastics are rugged and durable and are perfect for both indoor and outdoor playing. The loading arm lifts up and down and you can actually shovel different types of gravel with this tractor. With no assembly required, it’s ready to run and great for children ages 6 and over. The Siku John Deere front end loader is a true replica of the John Deere product line. Sized to perfection this radio controlled tractor drives like the real thing. The loading arm moves up and down and it’s made of die-cast metal which is sturdy. The lifting arm is operated on a separate system from the general motor. The driving lights work and the cab roof has LED lights. This true to life tractor is designed for the older kids ages 14 and above. Fun to play with but also a collector’s item, this John Deere tractor needs a little bit of care. This unique green and red tractor feature four large wheels with thick treads which are highly durable and can travel over all types of terrain. 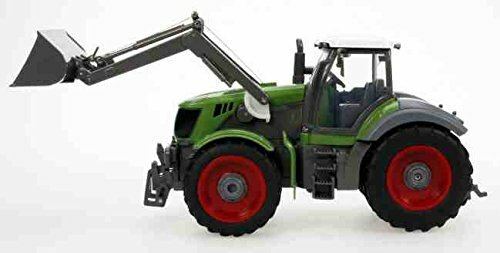 This 1/28 Scale 8 model of powerful high horsepower agricultural tractor this behemoth has increased power to help make the play day last longer for your child. This tractor is best played with by children 6 years and older and is perfect for indoor and outdoor use. It comes with a large trailer that can be attached to the back of the tractor by the tow hitch just like in real life. The controller requires a 9-volt battery which is not included. The best overall tractor will be the Fistone RC shovel loader. Complete with lights and sound and an impressive 300-foot range, this toy tractor easily wins out over the rest. Not only does it have durable tires that travel over every train but you can also operate other vehicles alongside it like a dump truck, excavator with a trailer and etc. Truly the choice for all around fun and play. If you’re on a budget Your Best Buy is going to be the Top Race 5-channel tractor. This tractor also features lights and sounds, however, is not quite as durable as the others. Perfect for indoors and outdoors this tractor will work in the sandbox and can handle some smaller pebbles.